EDIT BECAUSE ALAYEA TOLD ME TO: OBVIOUSLY THESE PRICES - REAL MONEY OR IN-GAME CURRENCY - MAY CHANGE OVER TIME. 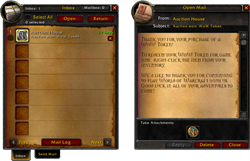 PLEASE CONSULT WOWTOKEN.INFO OR OFFICIAL BLIZZARD SHOP. 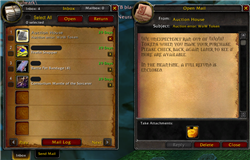 Listed and sold via a new tab in the Auction House UI on April 7, 2015, after maintenance concludes. Sold and traded in the Americas region (includes North America, Latin America, and Oceania) first before rolling out worldwide. Each game region has its own market: Americas, Europe, Korea, Taiwan, and China. Shop price for the token in Americas (NA, LA, AUS, and NZ) is $20 USD / $25 AUD, or 30K gold when it went live. EU is 20€ (15 GBP), or 35K gold when it went live on April 21, 2015. China is ¥30 CNY, or 35K gold starting point when it went live on April 28, 2015. Taiwan is NT$500 TWD, or 250K gold starting point when it went live on May 7, 2015. Gold price initially set by Blizzard Entertainment, but after that the price will change depending upon supply and demand in that region. 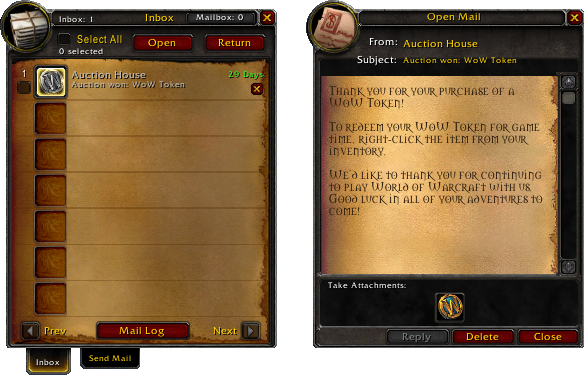 This specific item ID of the WoW Token is what players receive from purchasing the token from the Auction House. It may not be traded or re-sold, nor (at this time) may it be stored in your bank. Also, there appears to be a one minute cooldown period between searches for WoW tokens. If you are making a purchase of a token but the token is bought out before your own transaction is complete, the gold will be refunded in a letter sent to your mailbox (see screenshot).